1. How can Street View Trusted help my business? When potential customers search for your business by name on Google, they may see the images displayed directly on the Google Search results page. These panoramic images will also be published on Google Street View App, Google Maps and other Google properties. It gives customers a better sense of the layout, decor and beauty of your business interior. Using easy-to-use html embed codes you can also link to these images onto you own business website, attracting potential customers who visit your website too. Google Trusted Photographers are taking high-quality still photographs that will be stitched into 360-degree views using panoramic camera technology. These Trusted Photographers are independent contractors who have been trained and certified by Google to produce high quality panoramic images. As a business owner, you can also upload your own photographs to your Google Page by signing into Google My Business. You’ll be able to see the photos and 360-degree panoramic imagery directly on Google search results and on your Google My Business. 3. What will the Trusted Photographer do that I can’t do myself? 4. Where are Trusted Photographers currently active? Trusted Photographers are scheduling photo shoots with business owners in the U.S., Canada, Spain, Italy, the UK, France, Netherlands, Sweden, Denmark, Switzerland, Ireland, Australia, and New Zealand. 5. Can a business anywhere in the world apply for a photo shoot? We do not allow Trusted Photographers to upload imagery of legal establishments, residental, and a few other businesses. The best is to contact us if you have any concerns and see if your business qualifies. Because Trusted Photographers are not employees or affiliated with Google are independent businesses they individually decide how much to charge for their services. We expect the Trusted Photographers to offer their services at a fair market value. 9. If I apply through this program, am I committed to participate? Just Send us a message on our Contact Page! We will answer all your questions and from there we will work out a time and date that works best for you! 2. Are Photographers available on the weekend or at night? Yes, we are available at any time of day or night! We accomodate the needs of your business that is convenient for you. 3. How long will the photoshoot take? In most cases, a photo shoot will take about an hour, but this varies depending on the size and complexity of your business. You are welcome to clean and tidy things up prior to the photography session, but remember that the aim of the photographs is to show customers what they would expect to see if they visited your business on a normal day. When in contact with the photographer, they will explain all details in an e-mail. Photo shoots will exclude any areas of your businesses which you would not like to feature. In addition, our photographers will always alert customers and employees before a photo is taken, to uphold their privacy. All panoramic imagery will be processed by our state-of-the-art blurring technology to blur out faces of any employees or customers who appear in the imagery. At any time you may request additional blurring or takedown of entire images through our Report a Problem link at either the bottom of the pano image, or within your Google Business Page. 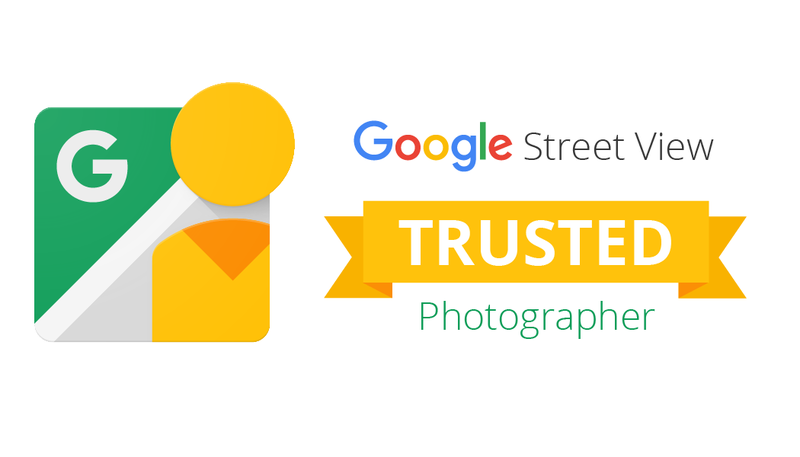 You must have the proper authority to allow a Trusted Photographer access to the business premises to collect photographs and to subsequently allow Google to put the imagery onto Google Maps and Search. People with this authority include the owner of the business or a director or manager with the designation to make those commitments on behalf of the business. Please note that by agreeing to the terms and conditions and the Google Terms of Service, before your photo shoot, you are confirming that you have the authority to make that commitment. 3. Will Google be using the imagery in other applications besides Google My Business Page? 5. Can I review the photos after they are taken and before they go live on my Google Business Page? Similar to our policy for Street View imagery, our “Report a Problem” tool enables users to request further blurring of images that feature the user in the 360-degree imagery. Users can also request the removal of images that display inappropriate content, and business owners can ask us to remove 360-degree images taken by photographers through the “Report a problem” link or the “Report inappropriate photo” link for feature photos..
1. Can I embed these images on my website? 2. Can I have a repeat photoshoot?